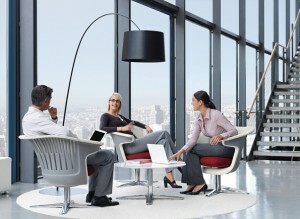 We love the new i2i steelcase chair. it’s making a real splash with office designers throughout the UK and beyond. As work is becoming more mobile, the standard single seat sofa just isn’t cutting it any longer. In order to meet comfortably, turn to interact with people and also share technology and laptop screens – the i2i chair has made a dramatic impact on informal office design. It’s virtually a workstation in itself. Check out the embedded video below to see how it works. i2i is designed to let people orient themselves to their fellow collaborators without taking away their focus or sacrificing comfort. This collaborative office chair supports a variety of postures so people can remain engaged, and stay connected. Different versions are available with Standard or 4 glide, a mobile base with 2 glides and 2 castors, swivel base or wivel base with automatic return to centre, in option, available in fabric or leather. At about £7-800 each they’re not cheap and almost twice as much as a more standard option, but they certainly seem twice the chair. They look good and are really practical. The back is flexible making it supremely comfortable. Not only does the chair itself swivel, but also the base of the chair swivels, allowing the user to adopt many comfortable seating positions. It can even have a tablet that connects to the arm of the chair so you can use a laptop while seated, and also the tablet arm swivels to quickly share your screen during meetings. We love it! The i2i steelcase chair is free of adjustments and is is 90% recyclable and contains no hazardous materials making it extremely sustainable. Its back features flexing “fingers” that provide comfort and support for different postures. The swivel mechanism allows users to swivel the seat and back together, swivel the back only (staying oriented to others while adjusting the posture to reduce fatigue) and swivel the seat only (keeping the posture but changing the orientation). The i2i chair has won a number of design awars including: 2010 Germany – iF Design Award. The Design Forum International in Hanover honoured the meeting chair i2i with the coveted iF Design Award. The iF Design Award has been one of the most important design awards since 1954. Every year more than 1800 products from 30 different countries are registered. The jury was composed of international designers. In 2009 the North America – Industrial Design Excellence Award i2i received a Silver Industrial Design Excellence Award (IDEA). This design award is sponsored by Business Week and judged independently by IDEA (Industrial Designers Society Of America).